Microsoft has posted an update on its Engineering Windows 7 blog outlining the latest news from the team behind the OS as it moves swiftly towards release. Signed simply 'Windows 7 team,' the post appeals to everybody using Windows 7 Beta to help test the Release Candidate (RC) too. But Microsoft wants Beta testers to do this by installing from Vista rather than an earlier build of Windows 7. Why? Because it wants to test the upgrade process from Vista specifically – how upgrades will be performed in what it calls "the real world." "You're anxious for a refresh. You've installed all your applications. You've configured and customized the system. You would love to get the RC and quickly upgrade to it from Beta," says the blog post, softening the way for the news. "The RC, however, is about getting breadth coverage to validate the product in real-world scenarios. As a result, we want to encourage you to revert to a Vista image and upgrade or to do a clean install, rather than upgrade the existing Beta. We know that means reinstalling, recustomising, reconfiguring, and so on. That is a real pain." While, you can simply upgrade your existing copy of Windows 7 using a procedure Microsoft outlines on the page, Microsoft is appealing to those who participated in the Beta to help it iron our any bugs which may occur during the installation process. "The reality is that upgrading from one pre-release build to another is not a scenario we want to focus on because it is not something real-world customers will experience. During development we introduce changes in the product (under the hood) that aren't always compatible with what we call "build-to-build" upgrade," the post says. "The supported upgrade scenario is from Windows Vista to Windows 7," continues the post. "Before you go jump to the comment section, we want to say we are going to provide a mechanism for you to use if you absolutely require this upgrade. [But] as an extended member of the development team and a participant in the Beta program that has helped us so much, we want to ask that you experience real-world setup and provide us real-world telemetry. Hailing the Beta testing so far, the post says everything "has been a remarkably valuable and beneficial testing cycle for Windows as we have had a tremendous amount of very rigorous testing and usage. We've had millions of people install and use the Beta since January and as we've talked about, the feedback and telemetry have been of tremendous value as we finalize the product." The blog adds that the challenge of the beta process is to make sure as many usage scenarios as possible are covered. "One of the most challenging areas to engineer is the process of upgrading one release of Windows to another. When you think about it, it is the one place where at one time we need to run a ton of code to basically 'know' everything about a system before performing the upgrade. "During the development of Windows 7 we routinely test hundreds of original OEM images from Windows Vista and upgrade them and then run automated tests validating the upgrade's success. We also test thousands of applications and many thousands of devices as they too move through the upgrade process." Microsoft says it believes it has improved the upgrade process and driver coverage, though it does say that most Windows 7 installs were completed on clean systems – something it obviously wants further tested as Windows 7 moves to RC status. It also restates the point that users should only install Microsoft-sanctioned builds of Windows 7. 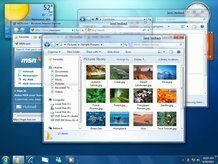 Earlier, we reported how Microsoft confirmed it isn't providing an upgrade path from Windows XP to Windows 7.